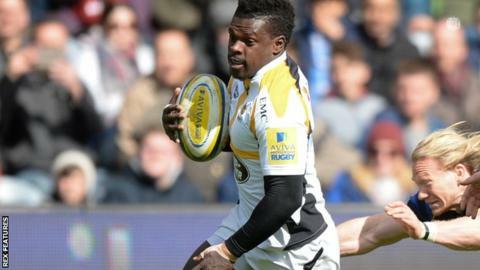 Christian Wade equalled the Premiership record for most tries in a game as he scored six against Worcester to lift Wasps to second in the table. England winger Wade scored four tries in the first half before adding two more from interceptions in the second to seal a play-off place for Wasps. Worcester crossed six times themselves in a game of 14 tries at Sixways. Wade, 24, matched the previous record set by Saracens' Ryan Constable against Bedford exactly 16 years to the day. Relive Christian Wade's six tries against Worcester as they happened. The British and Irish Lion's incredible individual display had started the day with five Premiership tries this season. But, on his 100th appearance for Wasps, he more than doubled that tally, jumping to second on the leading Premiership try-scorers chart, two behind Exeter's Thomas Waldrom, who has 13. Wade's first try came after Frank Halai had scored Wasps' opener in response to an early Ryan Mills penalty and, by half-time, Wade had stretched his personal tally to four, either side of Francois Hougaard and Cooper Vuna scoring for the hosts. Wasps were seemingly out of sight at 33-15 ahead, but Worcester scored four more tries of their own in the second half to pick up a bonus point. However, Dean Ryan's side could not keep up with Wasps and especially Wade, as he broke away for two more of his own before replacement fly-half Alex Lozowski completed their scoring late on. Wasps climb above Exeter into second and look well set for a home semi-final in the play-offs with two games to play. "The first 40 minutes weren't acceptable. We didn't apply ourselves. "We were easily picked off. We made it easy for them. "We haven't been at the races for the past two games. I'm not prepared to let the season drift to an end." "He's up there with the best. He's deadly. I wouldn't swap him for anyone. "It was a timely reminder from him that he's still about and shouldn't be forgotten for either the Saxons or England tours this summer." Worcester: Pennell; Biggs, Heem, Mills, Vuna; Heathcote, Hougaard; Rapava-Ruskin, Bregvadze, Schonert, O'Callaghan, Barry, Dowson, Kirwan, van Velze. Replacements: Symons for Mills (41), Annett for Bregvadze (44), Cavubati for O'Callaghan (44), Leleimalefaga for Rapava-Ruskin (65), Johnston for Schonert (65), Betty for Dowson (67), Lamb for Heathcote (72), Baldwin for Hougaard (72). Wasps: Miller; Wade, C Piutau, Daly, Halai; Jackson, Robson; Mullan, Festuccia, Cittadini, Launchbury, Davies, Haskell, Young, N Hughes. Replacements: Rowlands for Launchbury (49), Jones for N Hughes (49), Simpson for Robson (49), Johnson for Festuccia (55), McIntyre for Cittadini (59), Macken for Daly (59), Bristow for Mullan (59), Lozowski for Jackson (65). Referee: J P Doyle (RFU).